18 year old Samuel Manley has been elected the new Youth Mayor for Lambeth. Samuel was elected by other young people in Lambeth, lives in the borough, but attends Prendergast Hilly Fields College in Lewisham. He will be supported by a new Deputy Youth Mayor, 12 year olf Emmanuel Adepoju from Archbishop Tennison School in Kennington. New youth mayor, Samuel, said: "Today I aspire to be Youth Mayor for Lambeth - tomorrow I aim to inspire our future young generation to stand up and be positive and influential role models." At a glittering ceremony on 27 February, Andrew Short, 15, was elected the borough's representative on the UK Youth Parliament. His deputy is Ify Ossai, 18. Entertainment at the event, attended by Leader of Lambeth Council, Councillor Steve Reed, included Lambeth dance troupe the Stylinquents, and local actor and musician Arnold Oceng. 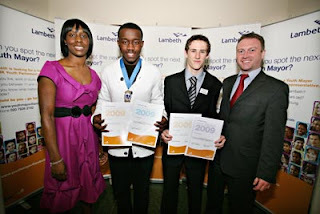 Lambeth Labour introduced the Youth Mayor in 2008, and it has been extremely successful, despite being branded as a 'gimmick' by the Lib Dems. This year’s Youth Mayor Elections attracted the votes of over 5000 local young people. The Youth Mayor acts as spokesperson for young people in Lambeth and provides a link between the young people, media, decision-makers and service-providers. The Youth Mayor is responsible for allocating £25,000 in funding to projects designed for and run by local young people. The Youth Mayor will also work in partnership with other members of Lambeth Youth Council to highlight and campaign on issues which are important to local people.